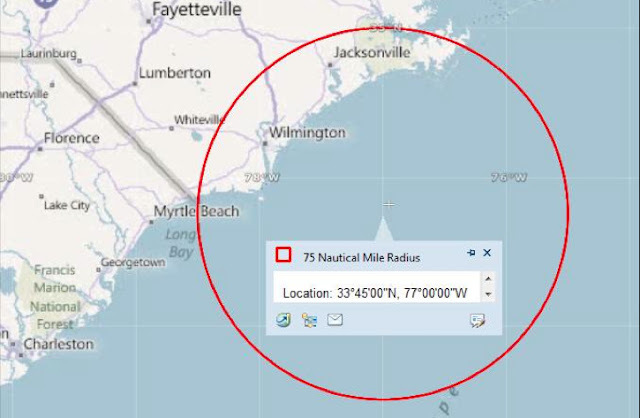 The United States Coast Guard Navigation Center recently warned of possible unreliable GPS readings from February 3 to 10, 2012 from 16:00 hours to 21:45 hours Eastern Standard Time off the North Carolina Coast due to testing on GPS frequencies utilized by shipboard navigation. The entire message is below. From Feb 03 through Feb 10, 2012, daily from 1600 EST to 2145 EST, the GPS navigation signal may be unreliable due to testing on GPS frequencies used by shipboard navigation, aviation and handheld systems. Systems that rely on GPS, such as E-911, AIS and DSC may be affected at an approximate testing center point of 33 45.00N, 77 00.00W, with an impact radius of approximately 75 NM from center point. More information is available at the Coast Guard Navigation Center website www.navcen.uscg.gov. 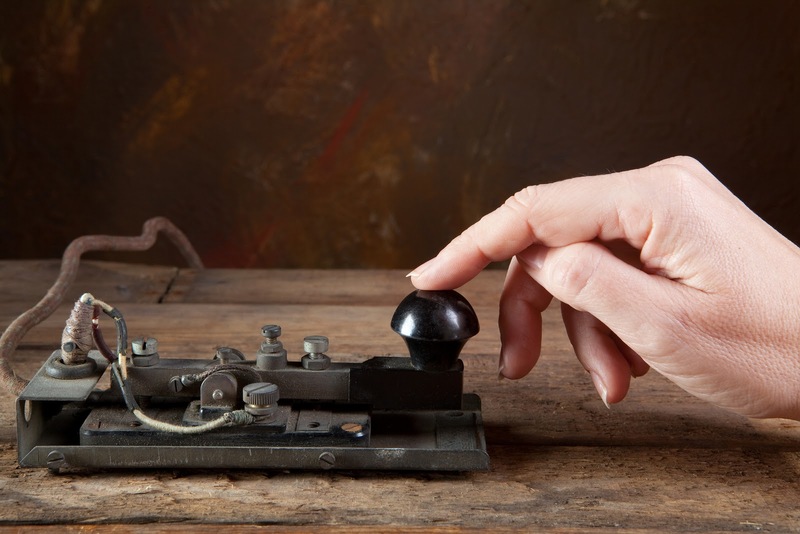 During this period GPS Users are encouraged to report any GPS service outages that they may experience to the Navigation Information Service (NIS) by calling (703) 313-5900 or by using the NAVCEN Website to submit a GPS Problem Report www.navcen.uscg.gov/?pageName=gpsUserInput . Amver participants should take note. Ships, give me more ships! The entire Amver team is thankful to the shipping community for continuing to rally around this voluntary ship reporting system. In the past week another 54 vessels enrolled in Amver, proof you take safety at sea very seriously. It's a good think too, because several ships went down in the last week, further demonstrating the need for a system like Amver to help coordinate search and rescue. Help us welcome the latest additions to the team. If it's shipwrecks you crave, or information on what accidents happened at sea, then check out the Shipwrecks Log on the web. The authors have daily updates of sinkings, allisions, groundings, and other maritime incidents from around the world. They're also provide updates on things such as the Concordia sinking and recovery efforts. We've added it to the Amver reading list. What a week. The Costa Concordia has dominated the headlines for the last few days. What is the response to an incident like Costa Concordia, here is a good start. The best response, however, is having adequate resources to assist in maritime disasters. Help us welcome the latest members enrolled in the Amver safety network. The IMO has declared 2012's World Maritime Day, "Titanic; 100 years later" and has recently posted a release after the Costa Concordia sank in Italy and several other maritime accidents. Here is the complete statement by the International Maritime Organization. IMO Secretary-General Koji Sekimizu has expressed his condolences and sympathy for all those caught up in tragic accidents involving ships over the weekend. “Causes of this accident are still not yet established. We must wait for the casualty investigation and should not pre-judge or speculate at this stage. I would like to urge the Flag State administration to carry out the casualty investigation covering all aspects of this accident and provide the findings to the IMO under the provisions of SOLAS as soon as possible,” he said. The recent sinking of the Costa Concordia (yes, some people are calling it a grounding while others are calling it a sinking) has many people asking how it could happen. At Amver we don't speculate on how these incidents happen, we focus on the response. We coordinate search and rescue at sea using commercial ships. Read more about how it works here. People may also wonder what sorts of plans are in place when a cruise ship does end up in trouble. The United States Coast Guard has a robust Mass Rescue Operations program. In fact, there are international standards for cruise ships to prepare for such incidents. What sort of plans? Here are an example of the content available on mass rescue. The Amver community is keeping the passengers, crew, and responders in our thoughts and prayers. Need to speak to someone about Mass Rescue or Amver? Contact us here. News reports are starting to filter in about the cruise ship Costa Concordia running around in Italy. Some news reports state that passengers may have jumped off the ship to swim to shore. While the details of the incident unfold its important to know that plans are in place for these types of maritime incidents. First, the Amver system is a worldwide, voluntary search and rescue system that use commercial ships to assist in these types of incidents. You can learn more about Amver here. Second, the United States Coast Guard has a robust Mass Rescue Operations program that routinely exercises with the cruise community for situations like this. Our thoughts and prayers are with the passengers and crew members of the Costa Concordia as this situation continues to evolve. The sinking of the Vietnamese ship Vinalines Queen on Christmas Day, 2011 started a large scale international Amver search and rescue effort not seen since the sinking of the Salvador Allende in 1994. "We received a distress alert message from the Vinalines Queen at midnight on December 25, 2011," said Mr. Nguyen Anh Vu, General Director of the Vietnam Rescue Coordination Center. "We have carried out search and rescue operations with Taiwan Rescue Coordination Center, Philippine Coast Guard, Japanese Coast Guard, and U.S. Coast Guard rescue authorities in Hawaii," Vu added. The U.S. Coast Guard provided Amver information to Vietnam to assist in the search. The Vinalines Queen was carrying nickel ore from Indonesia to China with a crew of 23 when it sank. "This is the largest search effort since 32 ships were diverted to assist the Ukrainian cargo ship Salvador Allende which sank on December 10, 1994 850 miles northeast of Bermuda," said Benjamin Strong, Director of the U.S. Coast Guard Amver Center in New York City. 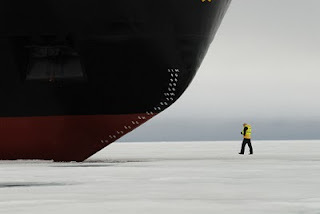 "Amver takes its history from the Titanic sinking 100 years ago," Strong added, "We are proud that so many ships agreed to divert, ensuring no call for help goes unanswered." On December 30, 2011 the aptly named Amver participant London Courage found a drifting life raft and rescued Da Ngoc Hung, the only survivor from the Vinalines Queen. An additional 20 Amver ships from 12 different nations participated in the search for the remaining crewmembers. Vietnamese news reports Hung is unhurt and has returned home. Amver participants from Japan, Monaco, Singapore, South Korea, Taiwan, Norway, Greece, Germany, United States of America, Great Britain, Malta, and Hong Kong have searched unsuccessfully for the remaining 22 crewmen. Want to learn more about Amver? Check us out here. Every year we receive holiday wishes from our Amver participants at sea. These wonderful messages should serve as a reminder that life at sea is hard work, requiring our shipmates to be away from home and family. Thank you seafarers and shipmates. Here is a sample of some of the wonderful holiday wishes the Amver team received. As we chart a course through the new yar we wish all of our members a healthy and prosperou2 2012! 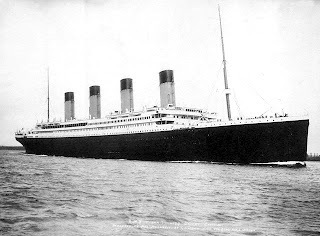 Remember, the IMO has declared 2012 the year to remember Titanic, 100 years later. 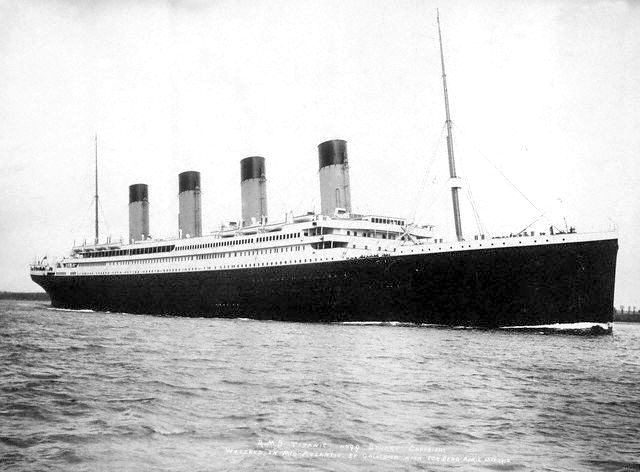 The Amver system was established as a result of the Titanic disaster. Today Amver ships save a life every 33 hours, providing a blanket of safety at sea around the world. Amver is looking for class; ice class that is! The recent cases in Antarctica (the Russian fishing vessel taking on water and the Korean fishing vessel on fire) demonstrate a need for a way to quickly identify ice class vessels that can respond to incidents in the Polar regions. The Amver team is busy working out ways for search and rescue authorities to quickly find ice class ships that may nearest an emergency. We just need more ice/polar class ships to enroll. Help us better respond to maritime incidents in the Arctic/Antarctic and enroll your ice strengthened ships today. We were reminded recently that not everyone knows about Amver. This may be your first time visiting our site. With that in mind we thought it was important to explain just what Amver is and what we do. The Amver (a fancy acronym for Automated Mutual Assistance Vessel Rescue System) system is a voluntary ship tracking/reporting system managed by the United States Coast Guard. The mission of Amver is to provide search and rescue professionals with the location of merchant ships near a distress or other emergency at sea. The Amver system has been in operation since 1958 and was established as a result of the Titanic disaster of 1912. As Titanic was sinking, passing merchant ships thought the distress flares were simply the passengers and crew celebrating the maiden voyage of the unsinkable ship. Originally designed to track vessel voyages in the North Atlantic, the Amver system evolved and was a global search and rescue system by the 1970s. Amver is unique because it is voluntary and leverages the voyages of merchant ships from any nation, flying any flag. There are no fees associated with Amver. The United States Coast Guard does not charge survivors or for ships that participate in the Amver system. Today there are over 5,000 7,000 Amver ships reporting every day. What does that look like? Here is a great example of the location of Amver ships around the world. Why should a ship participate in Amver? Participation is voluntary, free of cost, and open to all ships regardless of flag or nation. Amver participation satisfies the requirements of 44 CFR, Part 307.11 for U.S. vessels to file position reports with the U.S. Maritime Administration. Amver information is protected as commercial proprietary information and is released only to recognized search and rescue authorities during maritime emergencies. Regular reporting to Amver ensures the location of your ship is known at all times during its voyage (in the event of an emergency). Regular reporting to Amver decreases the search area if a ship is unreported, overdue, or goes missing at sea. Amver reduces the time between notification and rescue response. Amver can reduce the time lost to vessels responding to calls for assistance by coordinating the rescue effort, utilizing ships in the best position, with the best rescue capability and eliminating unnecessary diversions by other vessels. Amver participants are under no greater obligation to render assistance during an emergency than vessels that do not participate. On the contrary, ships unfavorably located on the Amver plot may be released from their obligation to respond by search and rescue authorities. Amver exchanges information with the Japanese Ship Reporting System (JASREP), the Australian Ship Reporting System (AUSREP), the Chilean Ship Reporting System (CHILREP), and the U.S. Maritime Administration (MAREP), so reports need only be made to any one system with a keyword added to the message authorizing exchange with another system. Amver reports transmitted by the Amver/SEAS software provide reporting of both vessel positions and weather data simultaneously, reducing reporting workload and cost. Amver is a demonstration of international humanitarian cooperation, mariner helping mariner, by assisting any person in distress at sea regardless of nationality or status. Your ship may be the one called upon to assist in an emergency. You may also be a ship in distress one day. How do you enroll your ship in Amver? Amver enrollment is easy. The video below shows you how (a transcript of the video is available here). Search and rescue professionals use a product of Amver called a surface picture, or SURPIC. Rescue professionals can learn how to request an Amver SURPIC here. All rescue coordination centers around the world are encouraged to do so. What's the result? Rescues like this one, this one, or this dramatic rescue. If you like what you see consider joining the Amver system. If you're a journalist or media person and you want to contact us, just click here. The hits just keep on coming! You have helped Amver obtain over 5,300 ships on plot for a 24 hour period. We are thankful for your assistance to shipping, ensuring no call for help goes unanswered and for continuing to enroll in the Amver system. Help us welcome the latest participants. 2011 went out with a bang here at Amver. An incredible number of commercial ships enrolled in the Amver system during the final days of the year. Thank you for your support. Help us welcome the latest members of the Amver search and rescue system. Thank you, Amver participants, for your continued support of the Amver system! 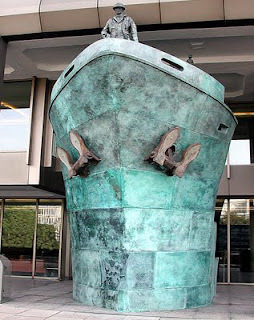 The IMO has declared the theme of World Maritime Day 2012 as "One hundred years after Titanic". Many of you know the Amver system was established as a result of Titanic. The need to identify ships in the North Atlantic near a distress location was realized, but wasn't established until the advent of the computer age- 1958. Now the Amver system tracks over 5,000 ships per day globally, diverting them to distress locations around the world and saving an average of one life every 33 hours. Let's not forget those people lost on that fateful night almost 100 years ago.